Ever since Scott Denmark told me about a gem of a paper back at the Bürgenstock conference a few years, I’ve been meaning to blog about it. Well, today is as good a day as any* I suppose, so here goes. The paper in question appeared in CHEMTECH (I bet that’s one American Chemical Society journal that many of you have never heard of) in 1981 and was written by Dietmar Seyferth and James J. Pudvin. The fairly mundane title ‘The generation of a highly reactive intermediate in the high-temperature pyrolysis of tetramethylsilane‘ belies some truly astonishing chemistry. The paper isn’t online, but here’s the Web of Science entry so that you know I’m not making this up. It’s a real paper, trust me. The article begins by noting a previous study that reports the pyrolysis of tetramethylsilane (and other organosilicon compounds) at temperatures of between 650 and 750 °C to form of ‘carbosilanes’ — compounds with Si–C–Si bonds. 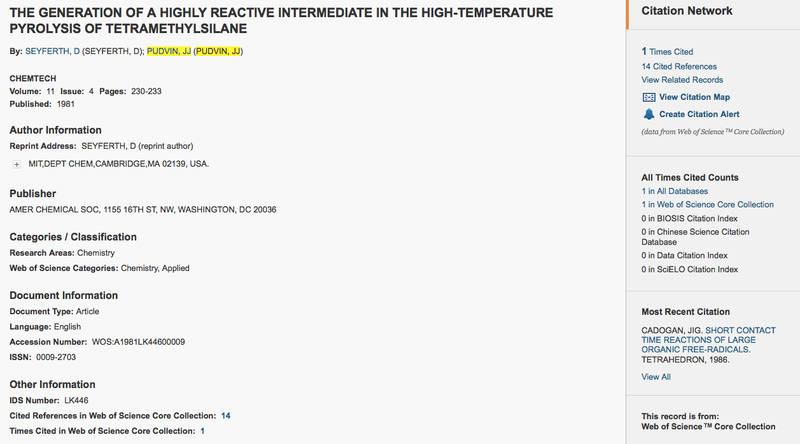 Seyferth and Pudvin point to their interest in reactive organosilicon species and suggest that the pyrolysis of tetramethylsilane at much higher temperatures than those used in the previous work could lead to even more exotic intermediates. They then set about testing their theory and describe an experimental set-up that enabled them to pass a feed of pure tetramethylsilane (a whopping 6.81 kg in a typical experiment!) through a flash-vacuum-pyrolysis unit that was capable of reaching temperatures of around 2,250 °C. An elaborate system of cold traps was used to collect the products, which were then analysed with a comprehensive range of techniques. Perhaps unsurprisingly, large amounts of hydrogen and methane were formed, along with other higher hydrocarbon products. That didn’t account for the silicon atom sitting at the heart of each molecule of starting material, however, but that was recovered as a mixture of silicon carbide and elemental silicon. After fractionation of other residues condensed in the liquid-nitrogen trap, just under a quarter of a gram of an amber liquid (let’s call it compound 1) was obtained — and this is where the fun/weirdness began. Three separate attempts to determine the elemental composition of 1 suggested that it contained no carbon, hydrogen or silicon. Molecular weight determinations gave a range of results (and were solvent dependent) and NMR spectra recorded in hydrocarbon solvents — even 50%-by-weight solutions of 1 — did not reveal any resonances (1H, 13C or 29Si) other than those arising from the solvent itself. What was strange, however, was that this mystery compound was interacting with the solvent, leading to shifts in their expected NMR signals. It was also noted that compound 1 exhibited some unusual reactivity — when dissolved in carbon tetrachloride in the open laboratory, both hydrogen chloride and carbon dioxide were observed to be formed. On further investigation it was found that solutions of 1 in carbon tetrachloride reacted with water (or dilute sodium hydroxide) and that all of the carbon tetrachloride was consumed in these reactions. It was found that the silicon tetrachloride was unexpectedly resistant to hydrolysis; even the reaction with boiling water was slow. The 29Si NMR spectrum of this silicon tetrachloride was also very strange in that the single expected resonance was shifted upfield by 0.15 ppm compared with a ultrapure commercial sample of the compound — and this observation was consistently reproducible. Other inconsistencies were found relating to the nature of the chemical bonding — the silicon tetrachloride produced in Seyferth and Pudvin’s experiment had longer Si–C bond lengths than would be expected based on other literature reports and they also exhibited an increased stretching frequency compared with commercial samples. The conditions of our tetramethylsilane pyrolysis were sufficient not only to break all Si–C bonds, but also to strip all of the unoccupied 3d orbitals from the gaseous silicon atoms which were generated at the high temperatures used. These then condensed and were isolated in the form of a dense amber liquid. And this astounding finding explains all of the anomalous observations described earlier in the paper. Because compound 1 is simply made up of vacant 3d orbitals, there would be no NMR signal (there are no nuclei to resonate) and there is no elemental composition to even be determined. Moreover the induced NMR shifts observed for hydrocarbon solvents can be explained by the interaction of these 3d orbitals with the carbon atoms of the solvents and the subsequent effect on their valence electrons. The reactivity of solutions of compound 1 in carbon tetrachloride are rationalized by Seyferth and Pudvin in terms of what they call ‘orbital grafting’. Whereas carbon tetrachloride is resistant to hydrolysis because there are no empty orbitals on the carbon atom of sufficiently low energy for uncharged nucleophiles (such as water) to attack, the grafting of unoccupied 3d orbitals to the carbon atom makes nucleophilic attack much easier — and hence the formation of carbon dioxide and hydrogen chloride from solutions of 1 in carbon tetrachloride proceeds readily under ambient conditions. This hypothesis also explains the unusual properties of the silicon tetrachloride formed from the silicon residues following the initial pyrolysis. Because the silicon atoms in this form of silicon tetrachloride have been stripped of their 3d orbitals, this compound is much more resistant to hydrolysis. Furthermore, the absence of 3d orbitals also explains the unusually long (and weaker) Si–C bonds than would typically be expected. The donation of electrons from the Cl atoms into the 3d orbitals on Si is no longer possible and so there are no resonance contributions from a putative Cl=Si species. Seyferth and Pudvin go on to calculate their isolated yield of 3d orbitals (using the rest mass of a 3d orbital reported in an earlier study) as 87%, which they say, “…attests to the efficiency of our pyrolysis process.” Not content with simply identifying the amber liquid, however, they go on to show how the availability of free 3d orbitals could have a huge impact in chemistry. As well as using the vacant 3d orbitals to create chemical curiosities, Seyferth and Pudvin show us a glimpse of the real-world potential too. Taking advantage of the orbital grafting phenomenon described earlier, the persistent environmental hazards posed by chlorinated and fluorinated hydrocarbons become less of a problem because these pollutants can now be more easily broken down by water. Moreover, it is shown that when nitrogen gas is added to an aqueous solution of 1 at 80 °C, it is possible to form ammonium nitrite — so vacant 3d orbitals can solve the problem of nitrogen fixation too! The paper ends with a discussion of future directions, suggesting that the process is not just limited to silicon. In theory it should be possible to obtain vacant 5d orbitals from tetramethyltin, although initial experiments were unsuccessful. It is thought that the more reactive 5d orbitals could be grafting on to the silicon atoms present in the glass traps in the experimental apparatus. Intriguingly, although the hydrolysis of tetramethylsilane is assumed to give equal amounts of the five different types of d orbitals, Seyferth and Pudvin speculate that it should be possible to strip specific d orbitals from suitable transition metals that have partially filled shells. It is surely only a matter of time before pure samples of dxy or dz2 orbitals are obtained and put into bottles. *Today is probably a slightly more appropriate choice than any of the other 364 days this year come to think about it. **There will be a follow-up post soon with a bit more background to this one (it’s here). This entry was posted in Fun, Publishing and tagged april, april 1st, april fools day, chemistry, d orbitals, dietmar seyferth, fools, fun, NMR, organosilicon, publishing, scientific literature, scott denmark, silicon. Bookmark the permalink. I was working at the R&D division of the Ethyl Corp. in Baton Rouge at the time the Pudvin/Seyferth article appeared in ChemTech. If I remember correctly the article was in the April 1, 1981 issue. It also had, as the requisite author photograph accompanying a ChemTech article, a picture of a person at a lab bench, wearing a lab coat, with their back to the camera. I had been at Ethyl since 1980, the year I obtained my degree. It was common in R&D for scientists to copy articles perceived to be of general interest and circulate them by paper mail to potentially-interested parties. One of the older chemists did so with the Pudvin article, writing in the accompanying memo that the reported chemistry might be useful in making amines or something to that effect. No one had the heart to confront him with it. I would sure like to find an electronic copy of that Seyerth publication to remind me of labs past. The heaviest naturally occurring element on Earth? A pocket full of what now?